Sony’s unique controller ensures stable 4K video recording thanks to 2-way communication to manage data bottlenecks with compatible cameras. *1 Based on Sony internal testing. Transfer speeds vary and are dependent on host devices, the OS version or usage conditions. Sony 120GB XQD memory cards are Shockproof, magnet-proof, anti-static and resistant to breakage – offering full performance even in extreme temperatures, under exposure to intense UV light and airport X-rays machines. 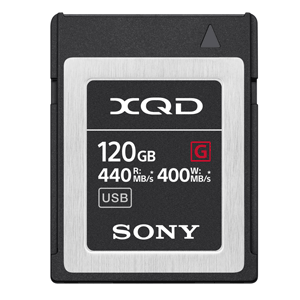 Designed for prolonged professional use, Sony XQD cards are tested for dependable storage, wherever you need to shoot*2. Sony introduces QD-G120F(120GB) and QD-G240F(240GB) to the product series. These models are significantly more robust than XQD standard. QD-G120F(120GB) and QD-G240F(240GB) are up to 5 times*3 more drop resistant – resilient against a drop of 5 metres*4. Pro users can be confident, even in the most physically demanding shooting conditions. QD- QD-G120F(120GB) and QD-G240F(240GB) also offer up to 2.5 times* more resistance to bend forces than XQD standard – increasing durability under repeated extraction/insertion at camera card slots. *2 Based on Sony testing. Actual performance may vary and is dependent on environment and usage. *3; *4 Based on Sony testing. We cannot guarantee against damage to recorded data or card in all situations and conditions. Aids in the recovery of photos and videos that may have been deleted. Applies most advanced algorithm to realize higher rate of recovery of RAW image, MOV files and 4K XAVC-S video files taken with Sony/Nikon devices. *5 Please refer to the URL http://www.sony.net/memorycard/ (Available in English only for some regions). Please note that not all data may be recoverable. *1Based on Sony internal testing. Transfer speeds vary and are dependent on host devices, the OS version or usage conditions. *2A portion of the memory is used for system files and may vary. *In combination with ExpressCard adaptor "QDA-EX1"